Are you suffering from everyday aches and pains that are putting a damper on your life and levels of productivity? In today’s fast-paced world, it’s imperative to stay at the top of your game, or else the competition will leave you in the dust. A common place for many people to experience pain is in the shoulder. Various rotator cuff injuries can lead to a lifetime of pain. It’s important to keep the pain in check by doing home therapy. A key piece of therapy equipment for the shoulder is a shoulder ice wrap. Shoulder ice wraps help to relieve symptoms associated with shoulder pain and provide you with the ability to keep moving. What are shoulder ice packs? The difference between traditional ice packs and shoulder ice packs is shoulder ice packs are specifically designed to contour to the shape of your shoulder. The ice pack is outfitted with a torso strap to keep it in place during use. No more holding a bag of ice on your shoulder or having to sit in a specific position to keep the ice in place. This means you can continue your daily activities while your shoulder is receiving therapy. Are you starting to see why it is much more advantageous to use a shoulder ice pack? 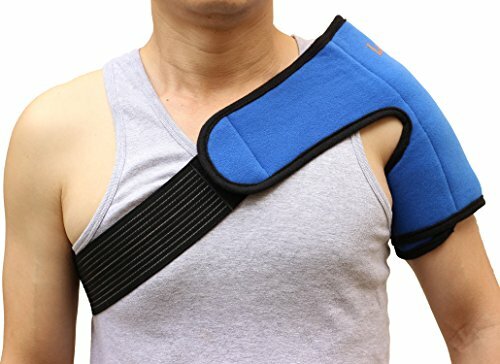 Who should use a shoulder ice pack? Speed up recovery from an injury – sports, medical etc. This premium quality shoulder/upper arm ice wrap not only targets the shoulder but also the upper arm, making it one of the best products on the market for sports players. 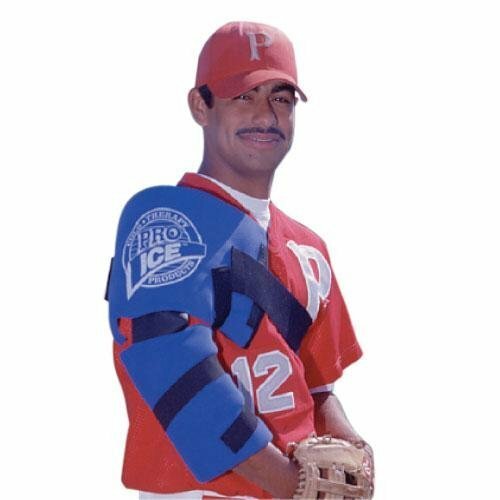 If you are a pitcher, a basketball player, play football, or any kind of sports that requires the use of your shoulders and arms, this Pro Ice wrap is perfect for you with its design aimed specifically to target the areas most often used by sports players. But don’t let that fool you. This blue wrap is great for anyone who suffers from shoulder pain that may radiate to their upper arm. You get great coverage from the back of your shoulder right through to the front, targeting all the key muscle groups. As a bonus, the arm cuff covers your biceps and triceps. Simply place the ice pack on your shoulder, secure the arm cuff in place using the velcro straps, and tighten the chest strap for perfect fit. So what are the pros and cons? -No jel products – no leaks, no mess. -Mini ice pack inserts freeze within an hour. -Ice packs stay cold for 20 minutes easily. -No travel bag to transport around. -The ice pack inserts can be tough for wearing after surgery or with severe injuries. Are you looking for a smaller size? Perhaps you have a younger child who is a sports player? Never fear. You can purchase the Pro Ice Cold Therapy Youth Shoulder/Elbow Wrap. This shoulder ice pack comes with all the bonuses and features of the adults version, just on smaller scale. Customized design for children ages 8 – 12. Looking for the best shoulder ice pack to help you recover from an injury? The O2 Cold and Compression Shoulder Wrap has you covered. 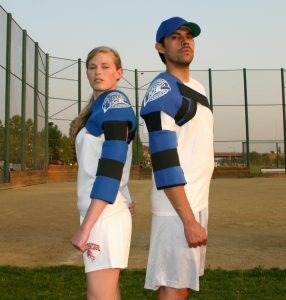 Unlike most other shoulder ice wraps, this one comes with a compression feature. 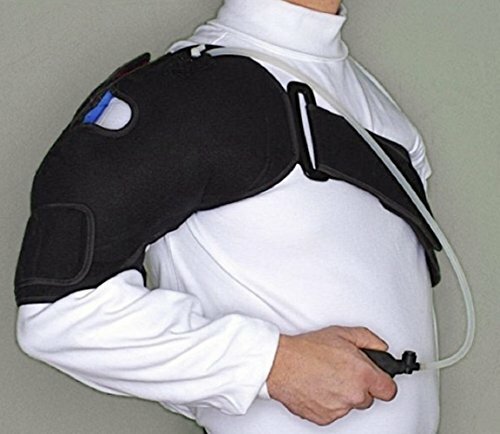 After you place the ice wrap on your shoulder, fasten the velcro straps around your arm and torso, you have the option to inflate the wrap with a hand held pump. By using the inflation option, the gel packs are pressed closer to your shoulder. This allows for the cold to act faster to relieve pain. Perfect for sports injuries, arthritis, muscle tension/fatigue, strains, and sprains. The O2 Cold and Compression Shoulder Wrap can be worn with or without inflation, making this ice pack wrap versatile. Let’s look at the pros and cons. •	Can be worn over clothes easily and without ruining them. •	Great mobility while wearing it. •	Some find fitting it difficult the first time. •	Does not have full coverage on top of the shoulder. This lightweight, flexible hot or cold gel-pack draws on the traditional method of applying a cold ice pack to your shoulder. But instead of trying to hold the ice pack in place in tiring and awkward positions, you simply slide the hot or cold pack into a pocket in the shoulder wrap. You then fit the shoulder wrap to your body using the velcro straps around your upper arm and torso. A great feature of this wrap is that the removable gel pack can either be cooled or heated, making it great for those needing heat and cold therapy. A very simple design allows for easy application. So what are the pros and cons? •	Stays flexible and gel will not become rigid if heated or cooled. •	Great for both hot and cold therapy. •	Some find the gel pack to be a little small to target big areas. •	Sizing may differ to other similar products. Here is another easy to use, hot and cold shoulder ice wrap. This ice wrap is perfect for anyone looking for a flexible wrap that is easy to adjust and apply with its elastic chest strap. Unlike the last wrap mentioned, this one covers a larger area on and around your shoulder, while also targeting your upper arm. The wrap comes in a leak proof plastic to ensure that the gel base will not leak onto your skin. It is intended to reduce inflammation, speed up recovery and aid in pain relief. Best of all, this wrap comes at an affordable price. Let’s take a look at the pros and cons. •	Can be heated or cooled for hot and cold therapy. •	Stay flexible and won't turn rigid after heating or cooling. •	Some find the wrap to be a bit tricky to attach the first time. Determine your main reason for needing a shoulder ice pack. If it’s for post surgery or injury, consider going with a wrap that is less rigid to ensure it doesn’t cause you pain. A gel based ice pack would work well. Determine when and where you are most likely to use your ice pack. You may need an easily transportable ice pack. If you are going to be on the move, look for something that allows for easy movement and flexibility. Understand if you will use your ice pack for preventative measures or an aid in recovery from injury. Some shoulder ice packs will target specific areas, while others may be versatile for both pre and post recovery. Please always remember, using hot or cold therapy (ice packs or heat packs) should not be painful. Never apply the ice pack directly to your skin and never apply an ice pack for more than 20 minutes at a time. 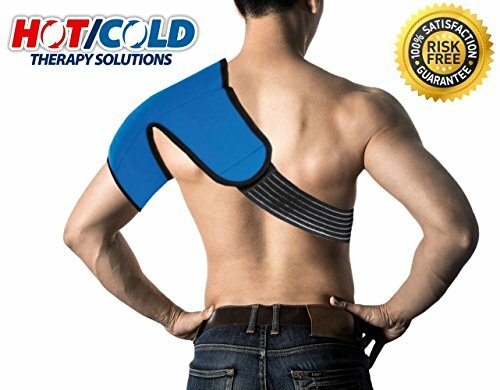 If you are living with pain or discomfort in your shoulder, you need to add a shoulder ice pack to your therapy routine. It’s important to keep your shoulder in good general health by easing any inflammation and pain. You’ve already seen how much these ice packs will benefit you, and read through to see the top 5 shoulder ice packs on the market. Now, it’s time to pick the one you think will provide you the most benefit.